The solution is based on Orion Diagnostica’s proprietary isothermal nucleic acid amplification technology, SIBA® (Stand Invasion Based Amplification). The first Orion GenRead test is for detection of Clostridium difficile directly from stool samples collected from patients suspected of having C. difficile infection (CDI). This affordable system is targeted to the toxin B producing gene tcdB and it is highly specific and sensitive. The results are available in less than one hour but high positive samples can be called positive already in 15 minutes, which is one of the system’s benefits. The Orion GenRead workflow is simple with only a few hands-on steps allowing it to be used outside traditional molecular biology laboratory facilities. The analytical reactivity of the Orion GenRead C. difficile test has been proven by testing an international reference laboratory’s collection of currently available toxin producing C. difficile strains. The performance of the system was evaluated in three clinical laboratories with 1160 prospectively collected patient samples by comparing the method against a nucleic acid amplification technology, a real-time PCR, and a combined antigen and real-time PCR based assay. 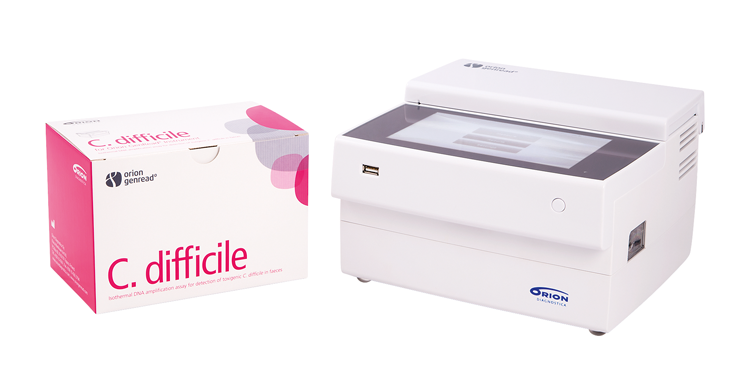 Orion GenRead C. difficile demonstrated 91.9% sensitivity and 98.1% specificity against the isothermal test. A sensitivity of 92.0% and specificity of 100% was demonstrated against the commercial real-time PCR assay. Orion GenRead C. difficile compared to the combination assay demonstrated a sensitivity of 93.3% and a specificity of 97.2%. The feedback received from the evaluation sites was very positive. The users liked the instrument that is easy to use and maintain. They also appreciated the short hands-on-time and quick results that enable fast patient treatment. The system allows testing from 1 to 12 samples in each run and this flexibility allows the test to be used in different laboratories settings varying from small to mid-sized laboratories.